If we turned time back a few years and you'd tell me that one of the shows that I would most enjoy watching would involve an anthropomorphic horse with substance abuse problems, I'd think you were crazy. And I still don't fully get what made me take a gamble on BoJack Horseman to begin with. But something happened over the course of the show to real something totally amazing. 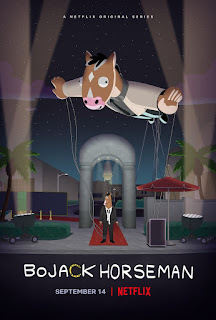 The show recently released its fifth season that continues to tell the story of BoJack and the quirky cast of characters around him. And it's a story that largely feels so real, which is a weird description for a show that involves people alongside various anthropomorphic animals of all shapes, sizes and colors. I thought the show had peaked with the fourth season as the revelations there were pretty heavy-hitting. But of course I was wrong and the world is better for it because there's still a heck of a lot of story in this horse. 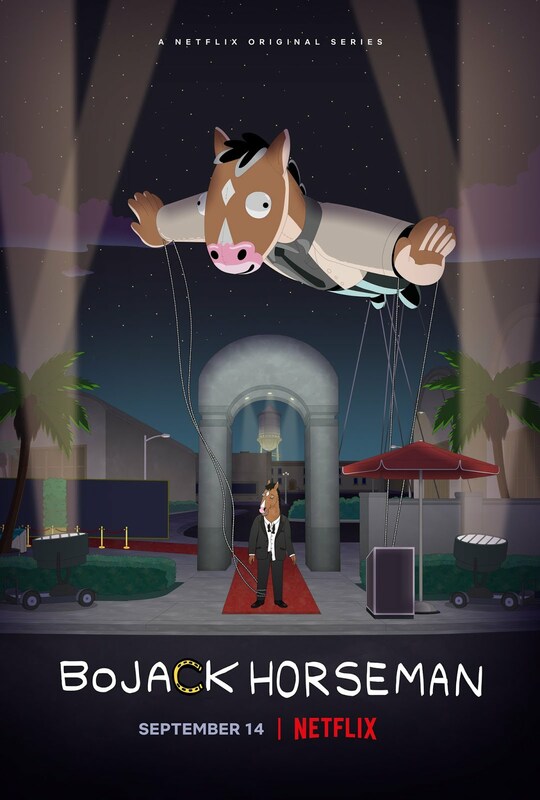 Synopsis: BoJack Horseman is an American adult animated comedy-drama television series created by Raphael Bob-Waksberg. As of the time of this blog review there is no confirmation yet about a sixth season, but I doubt the show is done yet. BoJack (Will Arnett) is definitely in a time in his life that's a big old mix of the good and the bad. He now has a better relationship with Hollyhock despite her not living near enough for more casual interactions but he's also in a weird television show because of Princess Caroline (Amy Sedaris). What's worse is that the show, Philbert, is based around the sort of down on his luck detective who makes a lot of bad personal choices and basically feels a lot like BoJack himself. And that doesn't do any real good for his sense of self-worth. Princess Carolyn is exploring adopting a child in order to address that need in her life. Diane (Alison Brie) and Mr. Peanutbutter (Paul F. Tompkins) are working out how to resolve their divorce and figure out their lives moving forward. And then Todd (Aaron Paul) is actually in a new asexual relationship, but of course that means needing to figure out how that's supposed to work and dealing with everyone else's expectations about how these things should go. What I Liked: I continually rave about how well this show depicts the complexity of living with various mental health concerns and that remains true in this season. In addition to that, they've expanded to explore other complex areas of life such as Todd's unique gender identity or Princess Carolyn's journey to become a mother regardless of her social status. There's some really amazing stuff to pick apart. And the show continues to try to be really creative and go with some very original episode concepts. Of course everyone is talking about "Free Churro", which is admittedly an excellent example of what the show is like when it really shines. But then it was immediately followed by "INT. SUB", which also had a very original concept and was equally brilliant while also being terribly funny. What Could Have Been Better: The show is definitely a lot more mature given it's already in its fifth season and that's always a challenge in itself. Add in the fact that there are so many characters who have been given continuing story arcs and thus not every arc is all that great. Mr. Peanutbutter continues to play the role of a running joke all throughout the run of the show and that's sort of the limitations of the character as written. He's stuck in these patterns and there's not much that can be done. Princess Carolyn's adoption arc is great and it has a lot of depth and substances but on the professional side it feels like she's really made some bad choices and now she's stuck in a bad place. And this feels particularly disappointing given how past seasons has depicted her as having so much of her life defined by her career and now it's all weird? But that also reflects her desire to shift focus to having a baby and this discussion will never end so let's stop there. Struggles man, struggles. TL;DR: BoJack Horseman continues to deliver a unique television experience through animation and it bewilders me at times to consider how it has managed to do all this. It's still not an easy show to love whether because its potentially triggering or because a lot of the characters have a lot of bad traits and habits but that's the way it is. Thus this fifth season gets a full 5 signs that BoJack's escapist tendencies continue to get the better of him out of a possible 5.